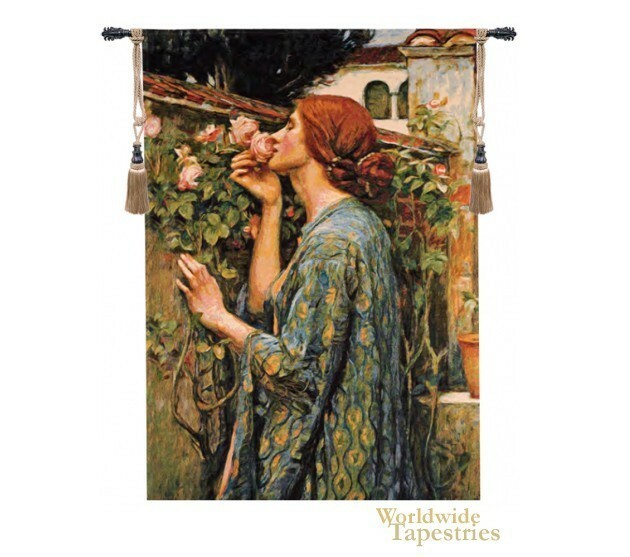 The Soul of Rose tapestry is based on the artwork of John William Waterhouse (1849 - 1917). Waterhouse was an English painter n the Pre-Raphaelite style and his subject matter were dominated by women from mythology or literature. Here we see a lady in the garden, based on the poem by Alfred Lord Tennyson, Come into the Garde, Maud. The poem begins "Come into the garden, Maud, For the black bat, Night, has flown, Come into the garden, Maud, I am here at the gate alone;" It is thought that the works of Waterhouse sought to represent the changing role of women in society, gathering power yet possessing sensuality and sensitivity. Here if based on the poem, is representing a love situation. The Soul of Rose tapestry is backed with a lining and a tunnel for easy hanging. Note: tapestry rods and tassels, where pictured, are not included in the price. Dimensions: W 28" x H 40"